Evolution, the silent engine behind atheism, attempts to turn mankind into nothing more than chemicals and random chance. Have we become nothing more than animals with ideas? The Question Evolution! Campaign at Creation.com will bring an eye-opening look at the questions that continue to go unanswered. The funny thing about unanswered questions is that they often continue to go on unanswered. I have a personal challenge to any so called intellectual who is running their engine on the power of evolution. 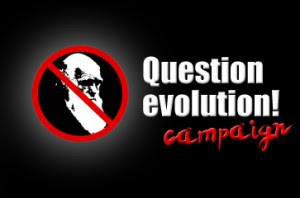 Take the time try answer these 15 questions of the Question Evolution! campaign. Christians come out from among them, learn the truth about microevolution vs. macroevolution. Become informed about the pseudoscience that hides behind the evolutionary curtain. The website Creation.com has many well researched articles and information to keep your engine running clean with the faith in Lord and Savior Jesus Christ. I live in the United States and in my native state of Tennessee, I am very committed to spreading this campaign. I hope to be able to root out some of the misconceptions and lies of evolution. I am going to spread this campaign as often as I can and I am expecting big results. The first item on my agenda as far as spreading the campaign is telling my friends about the campaign and getting them involved. In my community I plan on starting a Question Evolution! group that will be highly motivated and extremely dedicated.